Wikipedia has suspended at least 10 accounts linked to the public relations firm Bell Pottinger as it investigates allegations of content manipulation. The online encyclopaedia's founder Jimmy Wales told the BBC the lobbyists had "embarrassed their clients". He said a team of volunteers was looking at possible breaches of conflict of interest guidelines. Bell Pottinger admitted to editing entries, but said it had "never done anything illegal". Mr Wales said he was "highly critical of their ethics". "I've never seen a case like this. In general when I speak to PR firms they have ethical guidelines that would prevent this kind of conduct." While anyone is free to edit the encyclopaedia, the site's guidelines urge users to steer clear of topics in which they have a personal or business interest. "I offered to pop by their office next week and give them a speech on ethical editing of Wikipedia - but I guess they didn't think that was too amusing so they didn't respond," Mr Wales said. The investigation comes as blogger and search engine optimisation consultant Tim Irelanddiscovered activityby a Wikipedia user nicknamed "Biggleswiki". Mr Ireland said the account had been responsible for adding positive - or removing negative - information from entries about or making reference to several Bell Pottinger clients. In some instances, such as with theParamount Group, Biggleswiki requested "edit protection" after altering a page in the hope that other users would not be able to change the most recent amendments. Lord Bell, chairman of Chime Communications, the owner of Bell Pottinger, said an internal review had been launched. "I can't see any bad headlines for our clients," he told the BBC. "You won't find anybody, including journalists, who doesn't do exactly the same thing." He stressed that when companies had requested Bell Pottinger post untrue statements onto the site it had flatly refused - citing Wikipedia's guidelines. "We are having our own conversations with Wikipedia, and we are also conducting our own internal review to establish the facts." Bell Pottinger is one of Britain's largest lobbying and public relations companies. This week it came under fire after theBureau of Investigative Journalismreported that the firm had written aspeech delivered to the UN by the Sri Lankan president. Mr Ireland has called for Bell Pottinger to publicly declare the identities of the other accounts under investigation in order to reveal which other edits have been made. "I'd like to see that list," he told the BBC. "What they've done wrong here is they've not declared an interest. Let's see them do it - even belatedly." Lord Bell said there was no intention to make details of the accounts public. 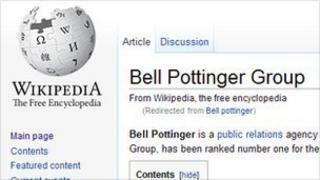 The Wikipedia team hasposted a list of articlesit believes have been altered by accounts traced back to Bell Pottinger. So far, they said of the 10 accounts identified, two had carried out over 100 edits each. Mr Wales highlighted an account -diginerd84- which was among the investigated accounts. The profile said it had been set up by a 50-year-old retired stockbroker in Mayfair with an interest in classic cars - particularly a 1929 Rolls-Royce Phantom II. "I will personally buy a full tank of petrol for Mr Draper's 1929 Rolls-Royce Phantom II if he exists at all," Mr Wales said. "Perhaps it's time for Bell Pottinger to issue another statement." The BBC has approached Bell Pottinger for a response to this claim but at the time of publication it had yet to respond. There is nothing wrong in itself in someone trying to correct perceived inaccuracies in Wikipedia articles - after all, that process happens every day and helps the online encyclopaedia get closer to an objective account. What is disturbing is the fact that the edits are carried out by an anonymous person who does not declare an interest. Wikipedia, which has grown into one of the web's most popular destinations since being founded 10 years ago, is edited by a huge number of volunteers who follow an agreed set of rules. Wikipedia's guidelinesstate that a conflict of interest (COI)represents an "incompatibility between the aim of Wikipedia, which is to produce a neutral, reliably sourced encyclopaedia, and the aims of an individual editor". It adds: "COI editing involves contributing to Wikipedia in order to promote your own interests or those of other individuals, companies, or groups. Where advancing outside interests is more important to an editor than advancing the aims of Wikipedia, that editor stands in a conflict of interest." David Gerard, a UK-based spokesperson and volunteer for Wikipedia, told the BBC that the investigation must establish whether or not Bell Pottinger carried out the edits in "bad faith". "We're having a close look. What the team is going to do is look at Bell Pottinger's clients and see what edits have been made. "We have plenty of experience in dealing with people who try to spin Wikipedia - after a while it becomes really obvious." He said that Wikipedia would be reviewing the effectiveness of its system for flagging up suspicious additions or edits.